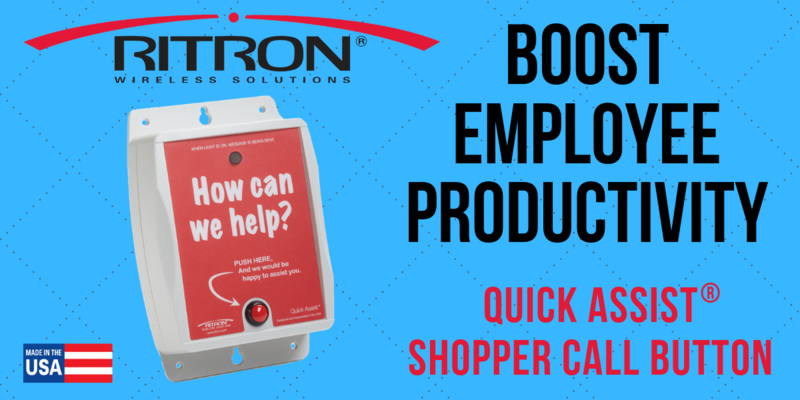 Just how can a shopper call button from Ritron boost employee productivity in a retail establishment? The goal of store management is to staff the store appropriately to take care of customers and daily business needs, but not to over staff the store. When determining staffing levels, management should be sure to take into account the number of Quick Assist Shopper Callboxes that are installed throughout the store. Changing Room / Fitting Room: Instead of staffing the fitting room area full time, assign an employee with a radio to an adjacent department to face merchandise, restock, and clean. When a customer requests access to a fitting room via the shopper call button, a customized pre-recorded message is broadcast to the employee radio. The one employee can work both areas, increasing their overall productivity. Parts Counter / Auto Service: Working the counter is often a shared responsibility among parts stock clerks, customer service personnel, and managers. With a Quick Assist Shopper Call Button prominently displayed at the counter, customers have confidence they will be attended to promptly. When those employees assigned to the parts counter carry two-way radios, they can stay busy nearby and respond quickly when the custom alert is broadcast to their radio. Locked Display Case for High-Value Merchandise: Retail stores we have worked with have installed a dozen or more shopper call buttons throughout the store which summon an associate when locked merchandise is requested by an interested customer. A team of radio carrying associates can be assigned to those locked merchandise cases. The broadcasted recorded message identifies the location of the callbox, so the nearest available employee can respond to the customer request and confirm to the radio network that the customer has been taken care of. Contact your retail clients today and ask them how they are boosting employee productivity, serving their customers, and protecting their assets.